TBD’s long, slow, painful road to death is over. TBD.com now reroutes to WJLA.com. So that’s that! I don’t have a lot to add, but I’ve blogged a lot about TBD here, so I should note the denouement. 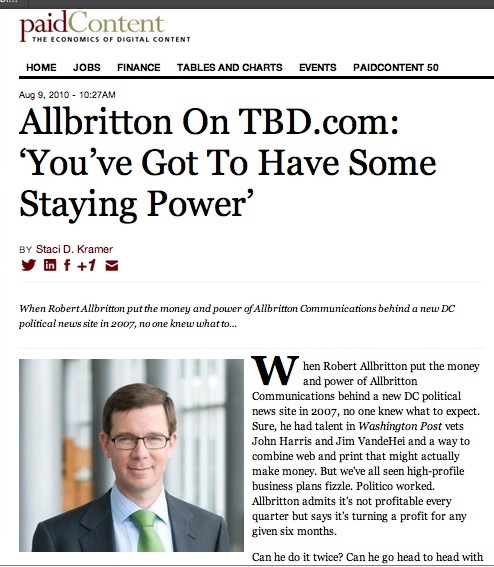 TBD made our mark in part through effective aggregation of Washington local news, so I’ll note its passing with some aggregation on its brief history. It won’t be complete, but I invite you to add some more links in the comments. Where I aggregate content from TBD, I should note that I don’t know how long it will remain available. Archived content appears to be online, though the home page and some searches redirect to wjla.com. Before we get to the actual demise, I have to share a link and screenshot from the coverage of our launch: I don’t believe any elaboration is needed here. Two years ago, I was working with Jim Brady, right, Mandy Jenkins, left, and Julie Westfall to launch TBD. Now we’re still trying to change the news business at Digital First Media. We’re together this week at the Thunderdome newsroom. 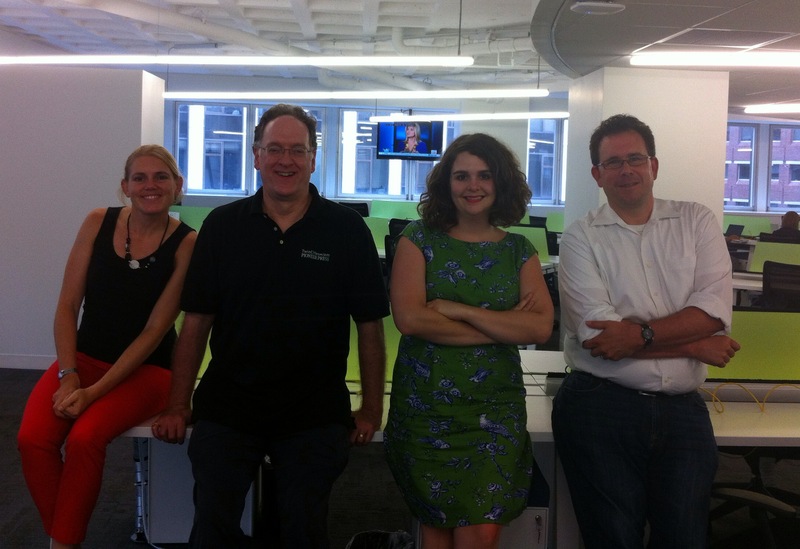 Two years ago today, an incredibly talented crew of journalists launched TBD. We had a lot of hype and a lot of fun, even if it didn’t last long. TBD now exists in URL only, its concept abandoned, its talent scattered, its name linked to history’s most famed sinking ship. But I have yet to talk to a colleague who doesn’t remember the experience fondly. My move to Journal Register Co. and Digital First Media and my work for my new companies dominated my writing this year on this blog. I’ve reviewed my blogging each of the past two years, so I’ll do it again in a post that clearly is self-indulgent. Still, I think it’s good to look back on a year’s work, and as long as I’m doing that, I might as well blog it. The most notable posts of the year were a series I wrote the week before Christmas, explaining aspects of Digital First journalism. The piece on the workflow of a Digital First journalist became my second most-read blog post ever in just a week. While it’s more than 3,000 views behind my Blueprint for the Complete Community Connection, I’m sure it will eventually become my most-read blog post. It took the C3 blueprint nine months to reach 5,000 views. The Digital First workflow topped that in just over a week. Three other posts in the series topped 1,000 views quickly. The St. Petersburg Times is planning to rebrand itself as the Tampa Bay Times. Here’s the primary reason I think you shouldn’t waste time, energy, focus and money rebranding a newspaper: Print newspapers are a declining business, and news organizations should spend time, energy, focus and money on building a successful digital business for the future, not trying to rebrand the product of the past. I’m a longtime fan of the St. Pete Times and the Poynter Institute, the non-profit organization that owns it (and depends on Times profits for its prosperity). I wish the Times well in its rebranding effort. I hope it reaps in great profits that fund growth of Poynter’s programs. I’m sorry to see Brad Rourke and Cindy Cotte Griffiths call it quits with Rockville Central. They served their community well with a lively forum for news and discussion. They were innovative, shifting their product from a website to a Facebook-only community. They were a delight to work with as one of the first members of the TBD Community Network. The simple fact is that it takes a great deal of energy and time to support the online community in the way we feel it deserves. We do not make money off of Rockville Central, and never intended to. It is a labor of love and devotion to Our Fair City. We don’t feel we can devote the kind of energy it deserves and so, rather than let it whither, we decided to make a clean end. A year ago, my TBD colleagues and I launched one of the great adventures of my career. Few remain there. TBD barely remains, its staff and mission diminished and redefined. Founding leader Jim Brady parted ways with owner Robert Allbritton last November. By February, Allbritton changed the mission and cut the staff. By May, I was gone.